CUSA Director and UCI Professor of Planning, Policy & Design and Political Science Dr. Richard Matthew recently co-wrote a chapter in the publication, Assessing and Restoring Natural Resources in Post-Conflict Peacebuilding. The chapter entitled, “Peacebuilding and adaptation to climate change,” is part of the book’s global initiative to identify and analyze lessons in post-conflict peacebuilding and natural resource management. The compilation is made from a total of 35 expert contributors and examines the experiences of more than twenty countries and territories in assessing post-conflict environmental damage and natural resource degradation and their implications for human health, livelihoods, and security. The book also illustrates how an understanding of both the risks and opportunities associated with natural resources can help decision makers manage natural resources in ways that create jobs, sustain livelihoods, and contribute to economic recovery and reconciliation, without creating new grievances or significant environmental degradation. To learn more, please view the book’s full details. Jensen, David, and Stephen C. Lonergan. 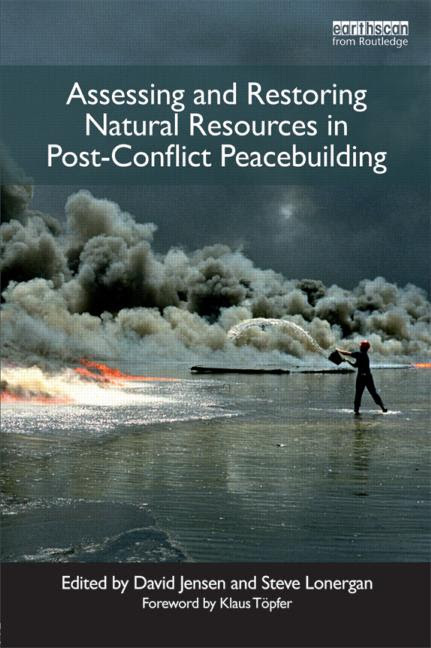 Assessing and Restoring Natural Resources in Post-conflict Peacebuilding. Milton Park, Abingdon, Oxon: Earthscan, 2012. Print.